SEATTLE — Washington's attorney general sued Motel 6 on Wednesday, alleging the national budget chain disclosed the private information of thousands of its guests to U.S. immigration authorities in violation of the state consumer protection law. Attorney General Bob Ferguson said motel employees divulged the names, birthdates, driver's license numbers, license plate numbers and room numbers of at least 9,150 guests to U.S. Immigration and Customs Enforcement agents without a warrant. At least six people were detained on or near motel property during a two-year period. Motel 6 was aware that the agents used the guest registry information to single out guests based on their national origin in violation of Washington state's anti-discrimination law, the state's lawsuit filed in King County Superior Court alleged. 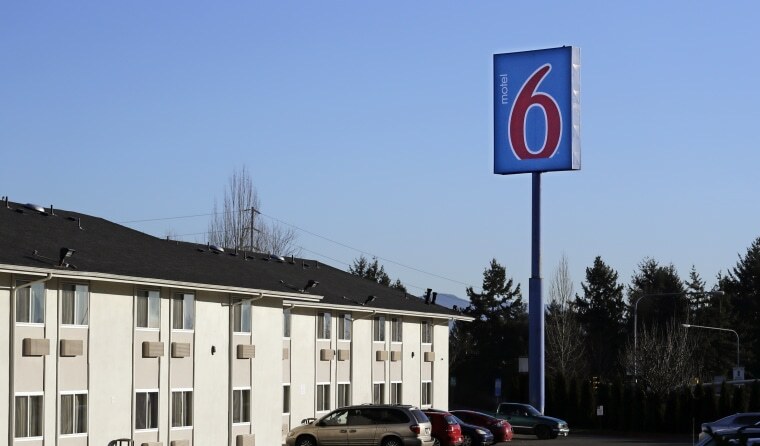 Ferguson said at least six Motel 6 locations in the state — all in the Puget Sound region and corporate-owned — provided the information without guests' knowledge or consent. Washington's Supreme Court makes it clear that guest registry information is private, he said, and Motel 6 violated the law each time it gave out private information. "In September, Motel 6 issued a directive to every one of our more than 1,400 locations, making it clear that they are prohibited from voluntarily providing daily guests lists to Immigration and Customs Enforcement (ICE)," the company said in an emailed statement. "Motel 6 takes this matter very seriously, and we have and will continue to fully cooperate with the Office of the State Attorney General," the company added. A spokesman for immigration and customs enforcement couldn't immediately be reached for comment. At one Motel 6 in Everett, north of Seattle, for example, agents visited early in the morning or late at night and received a daily list of all guests staying at the location, Ferguson said. The agents would target guests with Latino-sounding names, he said. The agency would then figure out if any of the guests were wanted in connection with civil immigration issues, the lawsuit alleges. The attorney general's office began investigating after news reports that Motel 6 workers at two Phoenix locations provided guest information to agents who later arrested 20 people on immigration charges. At the time, Motel 6 said in a tweet: "This was implemented at the local level without the knowledge of senior management. When we became aware of it last week, it was discontinued." Ferguson said the cases in Washington state shows that the practice was not isolated to the two Phoenix locations. "The company's actions were methodical. They trained their new employees on how to do this," Ferguson said. Motel 6 trained its new employees to provide guest lists to agents when they asked for it, without requiring the agents to show a search warrant or probable cause, the lawsuit alleged. Between 2015 and 2017, four of six corporate-owned locations that provided information to the federal agency released more than 9,150 guest names. That number is expected to grow significantly, Ferguson said. His office is looking into whether 15 other Motel 6 locations that operate as franchises divulged similar private information. Five locations did not disclose such information. The state's lawsuit seeks civil penalties of up to $2,000 per violation.